Grey thorax with three indistinct longitudal stripes. Abdomen has extensive area of yellow at base. 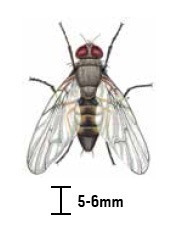 PestWest sticky traps and fly killers are effective at controlling the lesser housefly. 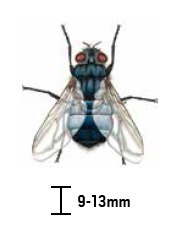 Thorax and abdomen black/blue in colour and often with a metallic appearance. Wingspan 18-20mm. 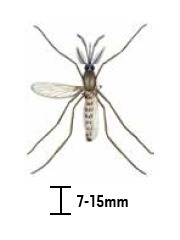 All PestWest fly killers are a very effective step in controlling these pests. 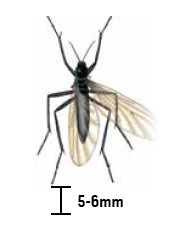 Large flies, wingspan up to 20mm. Thorax distinctive dark grey/olive colour covered in golden hairs. 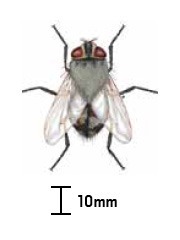 Areas where flies congregate should be treated with residual insecticide. 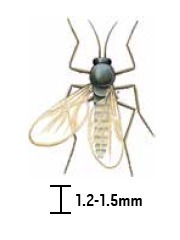 PestWest fly killers are a very effective step in controlling cluster flies. Small insects, wingspan 14-15mm. 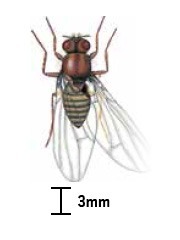 Black head, thorax and abdomen. Thorax has humped appearance. 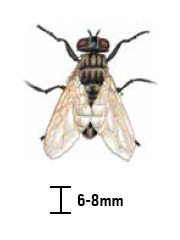 Chameleon® sticky traps are a very effective step in controlling mushroom flies. Small yellowish brown with darkly striped abdomen. Prominent red eyes. Chameleon® sticky traps are extremely effective at controlling these smaller insects. Slender, long-legged insect with forwardpointing, piercing and sucking mouthparts. Wingspan 7-15mm. Chameleon® sticky traps and electronic fly killers are extremely effective at attracting and controlling these pests. Dark brown/black in colour. Wingspan 3-4mm. Will swarm in large numbers and inflict bites. Thorax grey with four longitudinal dark stripes. 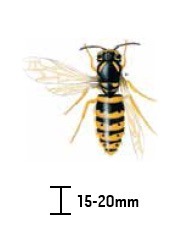 Sides of abdomen are yellowish and may be transparent. A dark band covers the final abdomen segments. 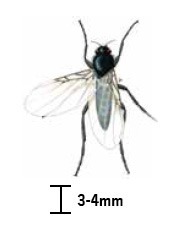 PestWest fly killers and sticky traps will effectively control houseflies.